We can create just about any printed item you need for your farm, bakery, local food non-profit, or other local food business. Our work includes business cards, brochures, booklets, posters, labels, food packaging, store signage, banners, menus, and more. Some clients come to us with a logo already designed and text already written, while others ask us to start from scratch. We'll be happy to jump in wherever you need us! If you're not quite sure what you need, we can also help you determine what sort of print items will help you reach customers or achieve your other goals. We designed a series of jam/jelly tags for several flavors of jam and jelly for Grounded Earth Farm. We worked with Roy Serafin to develop this poster, using the market's existing logo and photos. We designed this label for Grounded Earth Farm walnuts. We arranged advertising in the local food magazine Edible Michiana, and designed an ad using the farm's existing logo with our photography. We designed labels for this small farm's honey, frozen grapes, and lard — all using the farm's existing logo and font, plus water color imagery for a consistent look across all packages. We sourced a fun custom stamp and designed this loyalty card using the farm's existing logo. We designed this two-page fact sheet for Countryside Produce, a farm co-op, to use in introducing themselves to restaurants and institutions. We used the farm's existing logo along with photos we took to design this 4x10' banner for use at farmers markets. We designed the program, including this map, for our local food council's FarmHop. We also designed the event logo, and created web pages to promote the event. We designed this 12-page booklet for a local food non-profit to use in conversations with potential partners and donors. 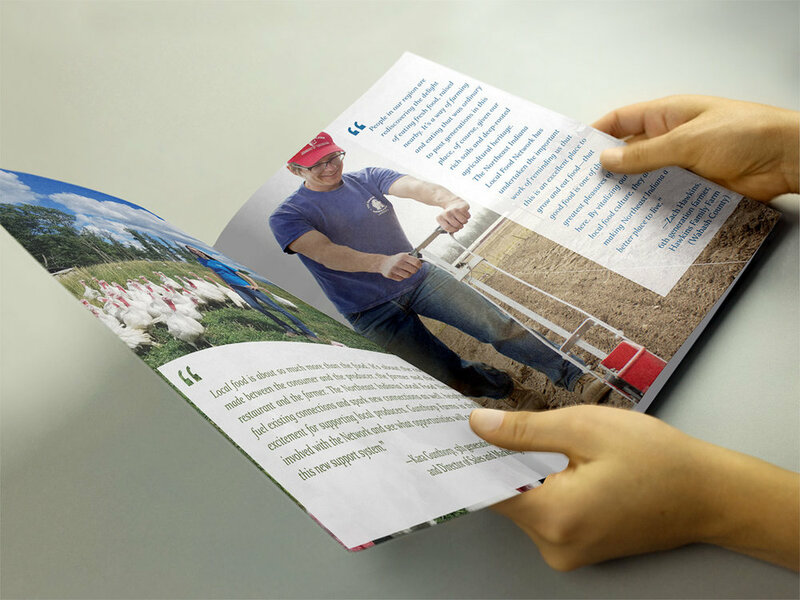 We used photos provided by their member farmers along with our own stock photography. We designed a series of cooler clings to highlight featured products (kombucha, eggs, cheese, and lard) for this local farm store, using the farm's existing fonts. 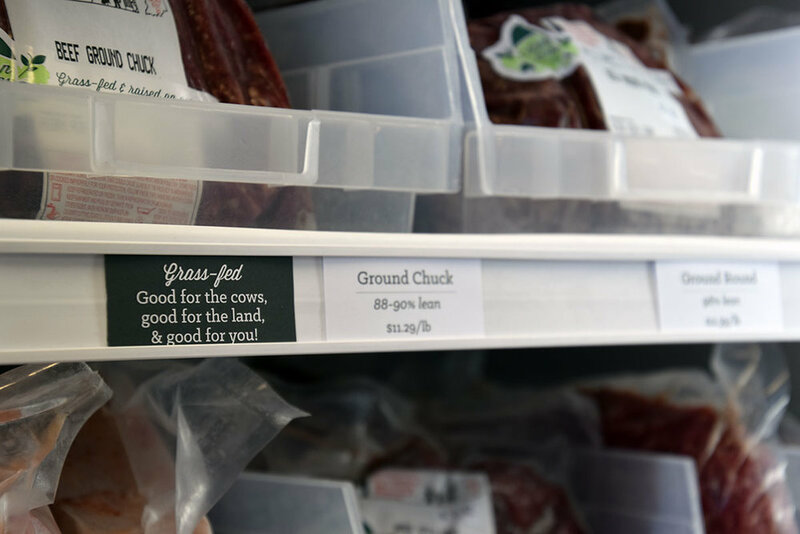 We planned, designed, and installed cooler shelf signage for meat and other items, using the farm's existing fonts. We developed this press release for a local food startup. Need marketing help for your farm, local food business, or local food non-profit?